We are located just 30 minutes from Salt Lake City, UT. We are a small team with a passion for history and connecting people to the past. Please contact us with your suggestions, thoughts, feedback or whatever is on your mind. Don't forget about our company blog, where we will talk about the latest happenings at Fold3. This profile page has been specially modified for the Fold3 Team. Since we use this account to make millions of contributions to the site we can't possibly show them all here. At Fold3.com you will find millions of images of original source documents, many of which have never been available online before. See all available Titles. 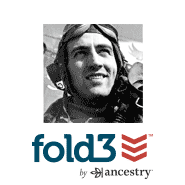 Fold3 has something for everyone, from individual history buffs to groups and societies looking for a smart way to make their collections available to millions of people. Learn more about how to use Fold3. If you have a large collection of source images you would like to make available on Fold3, please contact our content acquisition team, who can work through the details with you. Millions of images on the site are the result of our unique content partnership with The National Archives. These digital images of records preserved in the National Archives represent a growing collection of historic documents now becoming available online for the first time.